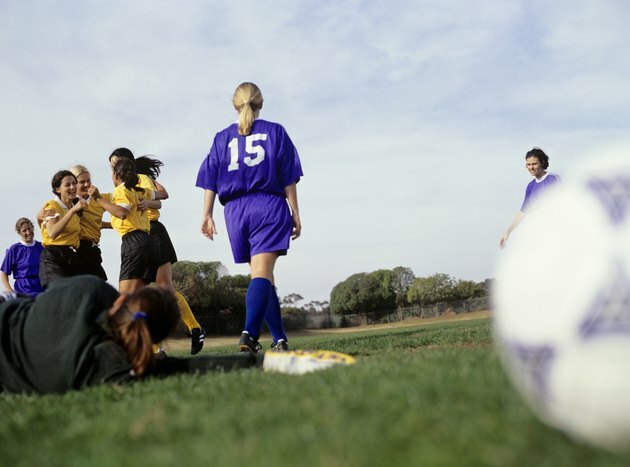 Soccer allows a fair amount of legal contact, although it still falls short of being a collision sport like hockey and American football -- where frequent, deliberate and permissible violent contact is part of the game. The Laws of Game administered by FIFA, the international governing body of soccer, specify what steps the referee can take to control pushing. Law 12, “Fouls and Misconduct,” of the Laws of the Game states that a referee may award a direct free kick to the opponent if a player pushes an opponent with excessive force or in a manner that appears careless or reckless. A direct free kick, which allows the kicker to attempt to score a goal on the kick, is taken at the point of the foul. If a reckless or forceful push occurs in the penalty box, the referee can award a penalty kick. Pushing is a major foul, along with kicking, tripping, jumping at, charging, striking or tackling an opponent. Pushing has been banned since the first drafting of the Laws of the Game in 1863, writes Stanley Lover, an international referee trainer and author of two books on soccer rules. The rule appears not only in FIFA’s Laws of the Game, which govern international play, but also the NCAA rules for American college teams and the National Federation of State High School Associations rules. The referee has enormous discretion on whether to call a push. He will not count a shoulder-to-shoulder charge with hands held into the body as a push, but if you extend your arms or splay your elbows away from your body and shove, that will be considered a push. He also will not likely whistle for a push if by remaining silent he can allow a goal-scoring opportunity to develop for the team that received the foul. Thus you see a steady parade of pushes, bumps and shirt grabs, especially at the pro level of soccer, that are not called by the referee. “The amount of force a referee will permit is relative to the experience and age of the players, but it should never be excessive,” notes the US Soccer Federation on the Ask a Soccer Referee website. You take a big risk in soccer if you shove a player in retaliation for kicking, shoving, spitting or making an insulting comment. The referee frequently sees only the retaliation and not the provocation, leading to a direct free kick or even a yellow or red card. Pushes to the chest or back of excessive force that send an opponent to the ground may well receive a red card, which ejects the pushing player from the game and the following match. What Are the College Football Defensive Holding Rules?